Horror Poll: Which actor’s portrayal of Dracula is the Best? Bram Stoker’s famous villainous vampire, from his massively influential Gothic novel – Dracula (1897), is one of the most portrayed horror characters in Movie and TV history… but whose portrayal is the best? We’ve selected our top 21 most notable, memorable or worthy performances – from which you can choose your favourite three in our Poll HERE – helping us decide who’s Dracula is the greatest. I’d just like to make two points before starting the list – 1, Max Schreck’s Count Orlok IS Count Dracula (but that name couldn’t be used for copyright reasons), and – 2, Christopher Lee is listed twice on purpose (once for his role in the famous Hammer movie series and again for another entirely separate movie role in Jess Franco’s Count Dracula). So… Which actor’s portrayal of Dracula is the Best? Vote for your favourite three in our Poll HERE. Discuss and debate this list or suggest other performances you think deserve to be listed here by replying to this post. Don’t forget to vote in our Poll HERE. Check out more of our Horror Polls HERE. The Horror Polls: The Curse of Frankenstein Caption Competition! The first of the Horror of it All‘s Caption Competitions is now open. These are just for fun. 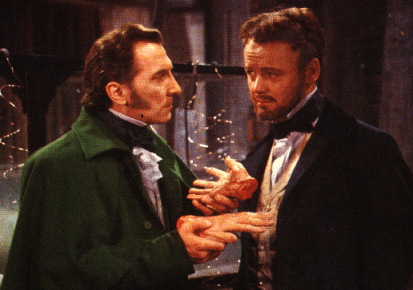 Featuring Peter Cushing as Baron Frankenstein (left) and Robert Urquhart as Professor Krempe (right). Frankenstein is saying “I admit that they are cold – but believe me. Close your eyes and it feels like someone-ELSE is jacking you off! Suggest your captions in the comments to this post – the funnier the better. Vote for your favourite Caption HERE. The Horror of it All is for all those who delight in horror, death, the macabre, the occult, black humor, weird tales, dark fantasy – and all such nefarious pleasures.